Posted: July 20th, 2009 under DX, EME, Hamradio, Soundclips. Good 6M openings has been missing lately. Most of the expeditions are qrt and I only managed 8R1DB of those who were on expedition. I had a miss with 3A2MD on the 8th of July. I heard Laura and called her, but she faded out. 3A seems to be a tough one to get. I did work one new grid with EA1KY in IN71. On Friday after work, I noticed EU working lots of USA again. I turned the yagi and checked. The noise was gone but no signals. After listening for a while, suddenly WZ8D popped up. I gave him a call and logged him quickly. Nothing else was heard, so I decided to give a few calls. K8MFO answered my cq, and that was it. Nobody else. WZ8D was still in and stayed in for a few hours. I checked the band again later that evening, and suddenly heard AC4TO, so I gave him a call. I once again tried a few cq’s and were answered by K4MM. After the qso, I continued to call with no luck. I must say this opening was quite spotty. Saturday didn’t produce any dx at all. I heard some europeans, but nothing I bothered to call. Later in the evening, I noticed Lance W7GJ was working EME. I checked my moon and it was setting, so I turned the yagi and started listening. I had some traces at around 13 degrees, but no decode. At around 7 degrees I got a cq from Lance. I started calling, but no traces until about 26 minutes later. I got the report from Lance and we quickly finished. After our qso, I had several good traces from Lance, and he peaked -15. I had his signal in until the moon went down behind a hill at around 2.5 degrees. Finally I got to test my 6m7jhv for eme work. 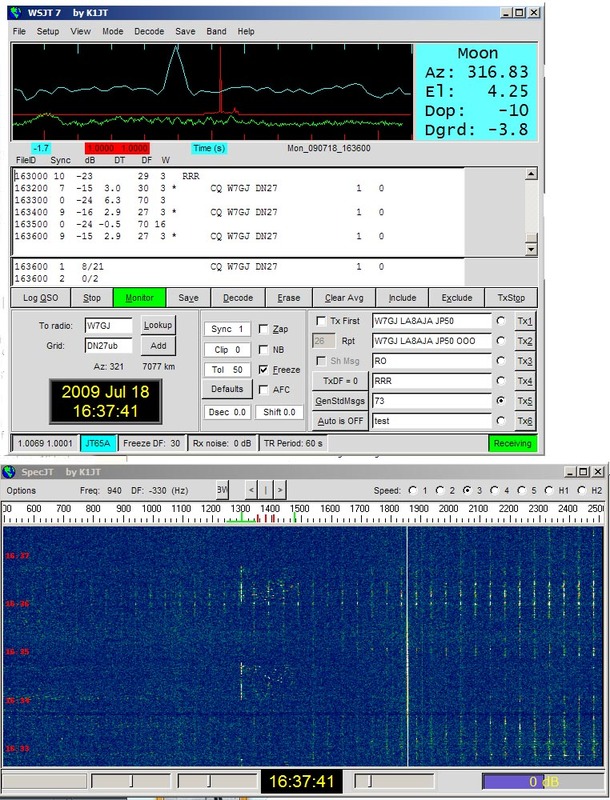 As it turns out, GM4WJA got my signals via the moon as well. He uses a 7 element yagi, so it seems that I may be able to work single yagi stations via the moon. What an exciting evening. When I got up on Sunday, I noticed ZC4LI spotted. I connected the gear and started listening. I heard CN and EA, but no ZC4. I parked the radio on ZC4LI’s qrg and started writing this post. Suddenly he came out of nowhere. After a few calls, I got him for a new one. That makes #118 on 6M. Finally I have ZC4 in the log. I have several 5B4’s, but ZC4 has been quite difficult. Signals were up and down a lot, but he peaked S9 here. I thought that was it today, but I had to edit this post for the second time 🙂 I heard F8DBF calling for JA’s. I couldn’t hear anything. Luckily my noise was gone today and I turned the yagi. No JA’s were heard, but since the path from F to JA are over my head, I went to 50104 and called cq dx. I called for a few minutes then suddenly JI2EVL showed up. My heart was pounding quite fast when the first JA was logged. I’ve never worked JA until today. That makes #119 on 6M. Several other stations followed and total number of JA’s worked was 23. 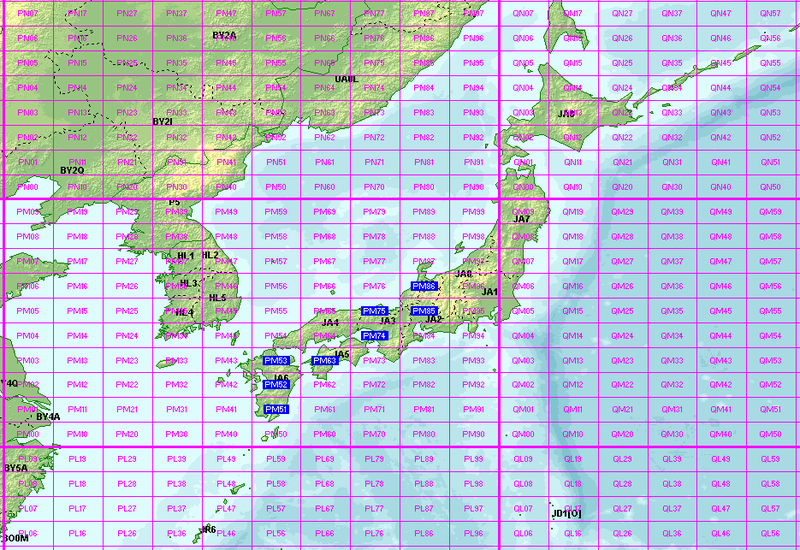 The opening seemed to last around 40 minutes and I worked 8 JA grids. Earlier this week, I almost thought the 6M season was over. This weekend surely proved otherwise. I’m happy to be your first LA. And I’m very happy to give you a new one back after you gave me a new one with HR in 2001. Take care and good dx.